The theme of this volume, The Church on its Past, was chosen to celebrate the fiftieth anniversary of the Ecclesiastical History Society. Under the Presidency of Professor Sarah Foot, this conference brought together leading scholars, among them Diarmaid MacCulloch, David Bebbington, Claudia Rapp and Matthew Grimley, to reflect on developments within the discipline of Church History in the fifty years since the Society's foundation in 1961. In this, the resulting volume, a first group of papers surveys ecclesiastical historiography over the last half-century, considering such key themes in Church History as the Reformation. Another group focuses on scholarship exploring the relationship between Church and State in different periods. A third group investigates the uses that the Christian churches have made of the past, especially in order to justify present agendas, and explores how those churches have constructed their own past. Traditionally much Church History has been written from the 'inside'; particular attention is paid to how the Catholic, non-conformist and evangelical churches have interpreted their own histories. The volume ranges widely over historical writing about the Church, from Eusebius and Socrates Scholasticus in late antiquity through Bede and Cardinal Boso in the Middle Ages to Martin Luther, Polydore Vergil, John Bale and Gilbert Burnet in the early modern period, and beyond. Both Protestant and Catholic approaches to writing the history of the Reformation, and of the pre-Reformation Church, are explored, including such aspects as the papacy and crusading. The influence of other approaches is also considered, notably those attentive to feminism and gender, and how far Church Historians have engaged with these. 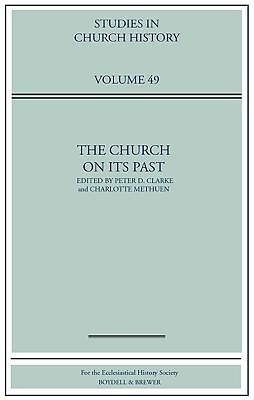 The richness and breadth of this volume's treatment of such a major subject make it essential reading for all students and teachers of and others interested in Church History. PETER CLARKE is Reader in Medieval History at the University of Southampton. CHARLOTTE METHUEN is Lecturer in Church History at the University of Glasgow.